Baby Costs > How Much Does Daycare Cost? Although many would like to stay home with their kids, it’s often hard due to financial reasons. Today, two-income households are becoming more common than one-income households, and while there are many options to choose from, such as daycare, a nanny, and before and after-school programs, a daycare is the most common solution to the problem. The cost of daycare can vary greatly from state to state and city to city. Generally speaking, the busier the area, the more expensive the daycare rates will be. According to BabyCenter.com, daycare costs can average anywhere between $250 and $1200 per month. The average national monthly cost of childcare is $611. Larger chains, such as KinderCare, may cost more than a local daycare center. For example, Kindercare may ask for $280 to $350 per week while a local no-name center could be near the $180 to $250 per week mark. Daycare costs can depend on a number of things: the quality of the daycare facility, whether or not the workers need to have some type of degree to work there, whether the daycare is set up like a “classroom” or if the kids just play, whether or not food is included or if you must send food with your child, etc. As mentioned earlier, a place, such as New York, will cost a lot more than a city in the middle of Montana. Some daycare centers are going to provide more than another. For instance, some may just watch over your child while others may provide educational activities. The more that you want, the more you should expect to pay. The longer the child has to stay in the daycare center, the higher the daily rate may be. The younger the child is, the more attention the child will need. Because of this, the rates can be higher. What’s included in the estimates? The full-time care of the child will be the main thing included in the quoted price. Depending on the state and the age of the child (see The National Resource Center for Health and Safety in Child Care and Early Education for information on regulations in your state), the ratio of adults to children will differ. Most daycare facilities include at least one meal — usually lunch — and a few snacks. 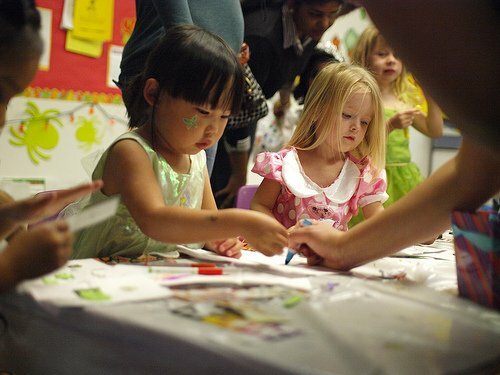 Organized play, free play, song time, classroom time, playground time, and nap are usually incorporated somehow into the daily routine of a daycare center. Centers will often offer either full-time or part-time programs. Full-time programs will be held during typical school hours, while a part-time program will be two to three times per week. Most rooms will be split into the following age brackets: 12 months, 24 months, 3 years old and 4 years old. Most full-time daycare facilities still require payment on days missed because of sickness or vacation unless ample (usually two weeks) notice is given. This is for scheduling purposes. Some daycares still charge for things like Christmas break and other holidays. Some centers charge extra for meals and snacks or give you the option of sending food with your child. Infants (children under 1) sometimes cost extra because they require more hands-on attention. Children with special needs or food allergies may sometimes be charged more because they require more attention. Don’t have to worry about them calling in sick. The problem with an in-house nanny is that they can bail from time to time. Daycare tends to be the cheapest option. Compare this to a nanny or home daycare center, and you will notice the difference. Great supervision through people that are certified through the state. This should give you peace of mind when handing your child over to a stranger. All staff members through most daycare centers are going to be trained in CPR and early childhood education. A daycare has to be licensed and registered in the state. Make sure you know your local state laws in regards to the child student ratio. There are some government programs that help low-income families with the cost of childcare. Most daycares have a discount plan for multiple children who are enrolled. Some centers will give discounts for families that are able to pay for a year of childcare up front. You may also want to consider a private babysitter. When asking about prices, be sure to ask what all is included, what payment plans are available, and any extra costs they may not advertise. The best way to find a daycare is by a word-of-mouth recommendation from someone that you know and trust. Not technically a “day care” but we pay $150 per month for a twice a week program through the local school.